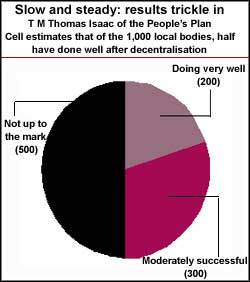 Four years of decentralised planning have resulted in a functional division between state plans and local plans. Policy analysts say this would lead to subsequent material improvement in local life, for example, better management of agriculture and water resources. "An important change is the right focus of planning and, so, the right use of available funds," says Paloly Muhammedkutty, the local administration minister. Isaac mentions assessments by various agencies, which show that out of 1,000 local bodies, 200 are doing very well, 300 are moderately successful and 500 are not up to mark (see graph: Slow and steady: results trickle in). "I can't claim that the programme is successful uniformly throughout the state. But if half of them are doing well than it would inspire others to do better," says he. The state's income growth rate in 1998-99 was 5.6 per cent as against 4.9 per cent in 1997-98. This became possible mainly due to a high growth of 3.82 per cent in agriculture, which was a mere 0.8 per cent 1997-98, according to the state's economy survey for 1999-2000. Cultivable lands lying barren are being brought under the plough (see box: Banking on labour). In Kottayam district, a panchayat has brought 1,000 acres (405 hectares) of land under cultivation. In Palghat, the average paddy yield per hectare has gone up from 1.6 tonnes to 3 tonnes. "Due to easy and timely availability of water, seeds and fertilisers, productivity has gone up," claims Shreedharan. From centralised water distribution, Kerala has entirely decentralised in this sector. Says Rukumuni R R, agriculture officer with the Mulamkunnathukavu Gram Panchayat, "Watershed development is now given top priority by the villagers as it ensures their water needs during non-monsoon period." A centralised water distribution system has been entirely decentralised. Says Rukumuni R R, agriculture officer with the Mulamkunnathukavu Gram Panchayat, "Watershed development is now given the top priority by the villagers as it meets their water needs during the non-monsoon period." For example, the Mulamkunnathukavu Panchayat in Ernakulam district has taken up watershed development as priority. Three of the wards of the panchayat are hilly and were facing water scarcity due to deforestation. "Our wells would go dry in the month of January. After that it was a four-km trek down to a stream in the valley for water," says A B Abraham, a resident. Now, more than 30,000 shock pits have been dug to let water percolate and 70 sq km of contour bunds have been built. "For the first time I saw my well having water in the month of May," says Lisi Kurian, who lives in a settlement on top of a hill. "Agriculture is again possible as some streams have become perennial," says Pacheri I A Sunny, a resident. "Paddy is now cultivated even on hilltops," she adds. Priorities set by the panchayat s are in total contrast to those of the planning board. Earlier, the state was spending around 5 per cent of its budget on agriculture. Now the panchayats spend more than 10 per cent on it. Sahayi, an ngo based in Thiruvananthapuram, surveyed the advantages of decentralisation. "Much greater priority is now accorded for basic needs such as housing, drinking water and sanitation by the local bodies. In the productive sectors, there is discernible shift towards animal husbandry, garden crops and minor irrigation," the survey indicates (see box: Social change and ecological health). Moreover, a new, strong and dynamic grassroots leadership is emerging. "After effective implementation of the Panchayati Raj, it is obvious that you would have a new leadership at the ward level," says A K Antony. Various leaders of different political parties explain that during the next election to the local bodies, selection of candidates would be based on their real performance. Says Shreedharan, "Decentralisation has made the local leaders more accountable. If they don't perform they are bound to be thrown out by the people." Quips Kutty: "Local bodies are going to be the next political battleground where genuine democracy would be tested."